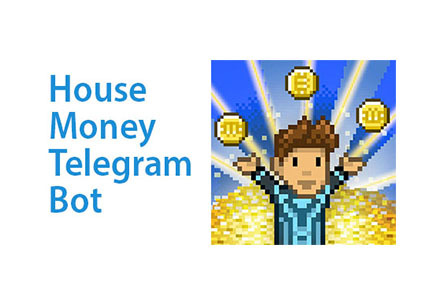 House Money Telegram Bot: House Money is a bitcoin earning bot. it's work on telegram messenger. House Money Economic game where you can earn real money. Payment Points Needed For Withdrawal. 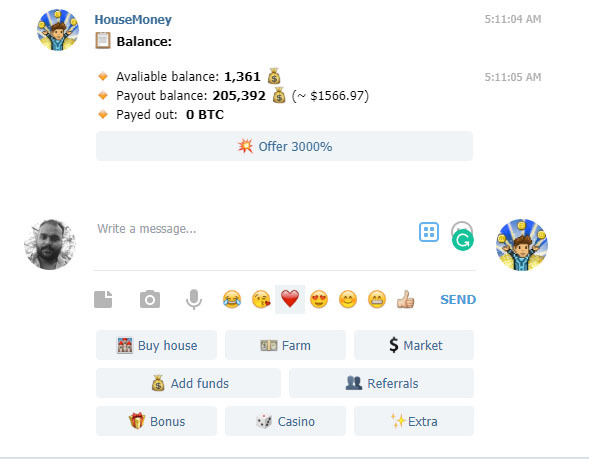 How To Work House Money Bot: House Money telegram bot works as other telegrams bot work like Dino Park and Cash Zoo Bot. Here you can buy a house and them give you money(game currency). this money helps you to buy more house. you can convert this money to moneybag in the Market Tab. BuyHouse: You can buy different types of houses here. Each type of house has a different rental and rent you can sell or exchange on real money (Bitcoin)! Each type of house has different characteristics and qualities. You can buy many houses! You will collect rent continuously for 24 hours and forever! 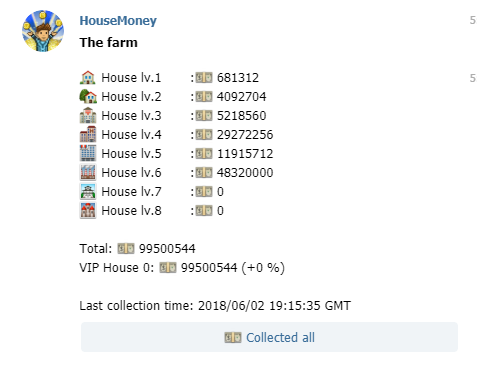 Buy VIP House: VIP House can mine not only dollar:! They make dollar and points! However, to buy such house you will also need points, and unlike ordinary house after some days of work such house retire. 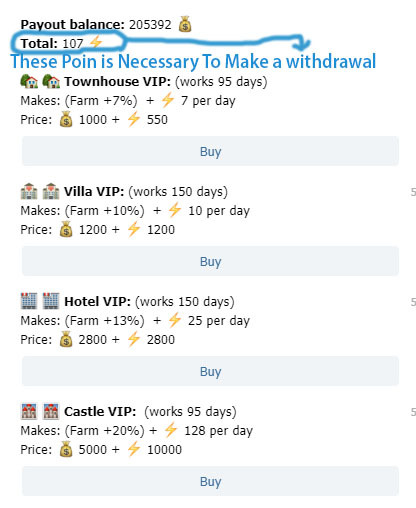 You can only buy a VIP house same time. Farm: Here you can see and collect your money. Market: Here You Can exchange your collected money for game currency. After the exchange, 70% you receive will go into your purchasing balance :moneybag: and 30% goes into your withdrawal balance. Current exchange rate: 1000 dollar = 1 moneybag. The minimum required for an exchange is 3000 dollar. Bonus: You can obtain the bonus every 24 hours. The bonus will payed by moneybag to available balance. The bonus will be generated randomly from 10 to 100 moneybag + zap Payment Point Probability: 1% receive 200 Payment Point. Extra: Here you can set your bitcoin wallet. change game language. order your payments. point.you can earn payment point with VIP House and Referrals Commission.